These homeowners had their painters strip off the old (dark red) wallpaper, and were eager to get the new wallpaper up in time for their annual Christmas Eve party. Even though I am booked up with work through most of March, I had an unexpected opening, and was able to get their paper up today. It was a little nip-and-tuck, though, because they had ordered their paper without first consulting a paperhanger, and, as commonly happens, they ordered too little. 😦 So, they had to pay mega bucks to get the necessary double roll shipped via 2nd Day Air, smack in the middle of the holiday shipping season. Happily, it got here 12 hours before the install day, and I was able to pick it up from the wallpaper store, to save the client the trip into town. We were also lucky that it was the same run number. The painters had done a good enough job stripping off the old paper, and originally, I thought all that I would have to do would be to prime the walls. But once I got to scrutinizing the walls, particularly the corners and edges, I knew that the walls could be in better shape. So I skim-floated and sanded just about everything, creating a very smooth, homogenous surface for the new wallpaper. All this added about three hours to my workday, plus some dust from sanding (which I vacuumed and wiped up). The job would have looked good enough if I had hung the paper on the painters’ “prepped” walls. But I was glad that I had taken the extra time and labor to smooth the walls and ceiling, because the finished job looked fantastic, with no uneven areas or bumps showing under the paper, nor any areas raising questions regarding adhesion. 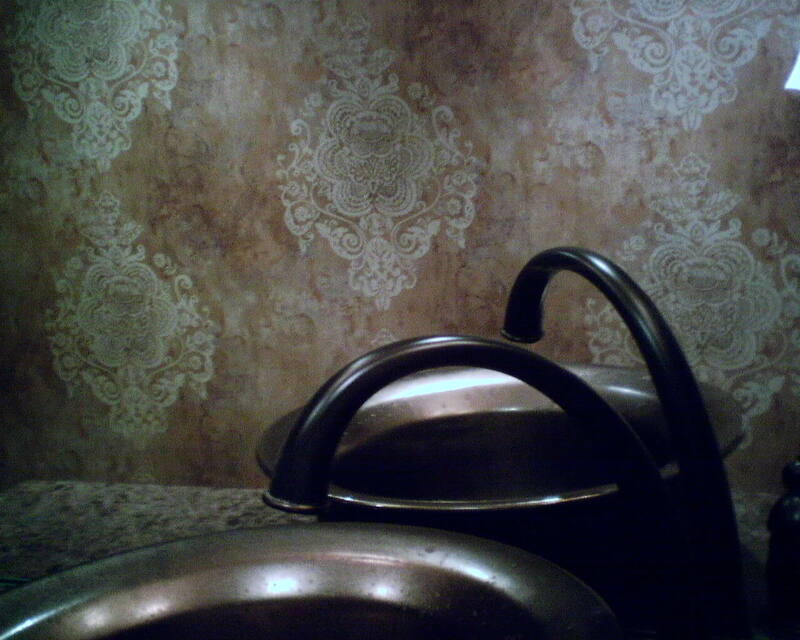 The two wallpaper patterns are by Designer Wallpapers, which is by Seabrook Wallpaper. They are in the same colorway, and are designed to work together, as coordinating, or companion, patterns. 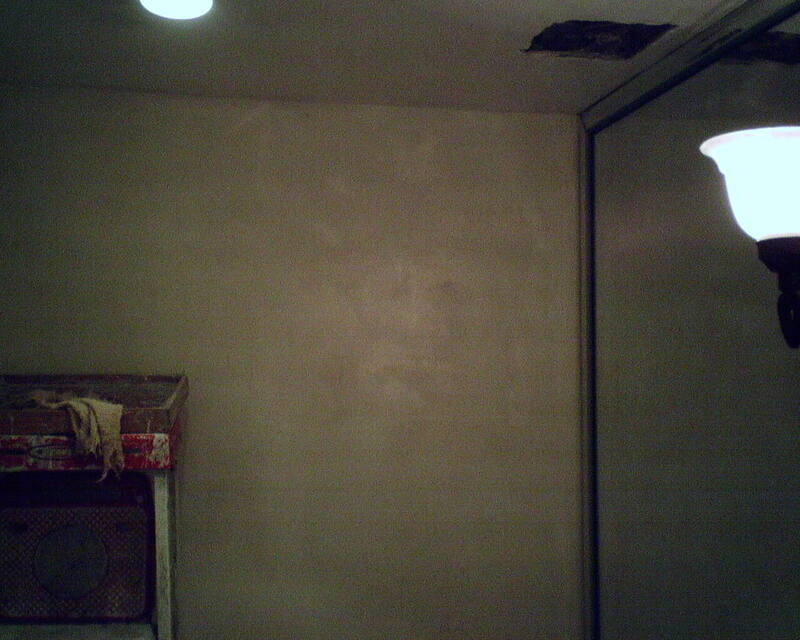 The murky brown, fuzzily striped pattern went on the ceiling. 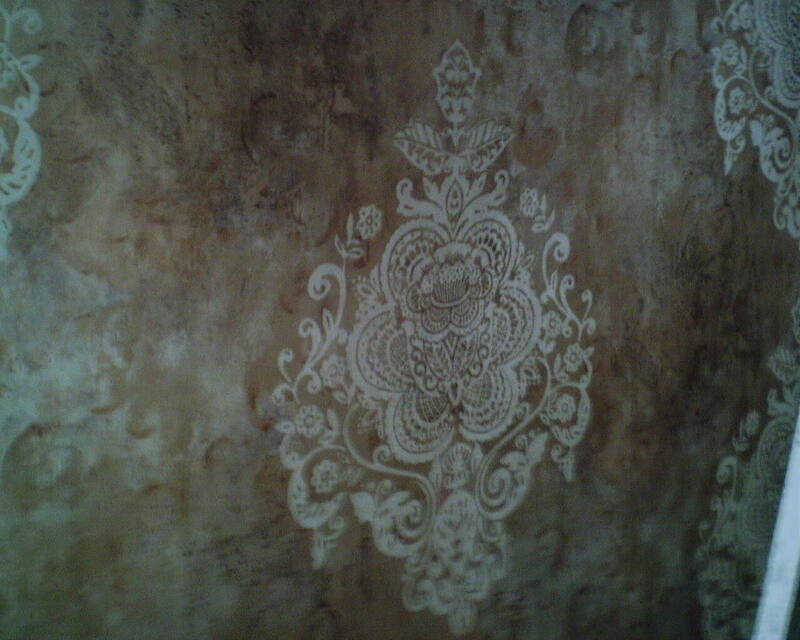 A coordinating brown, hazy pattern went on the walls, and it featured a foggy medallion in a traditional motif. 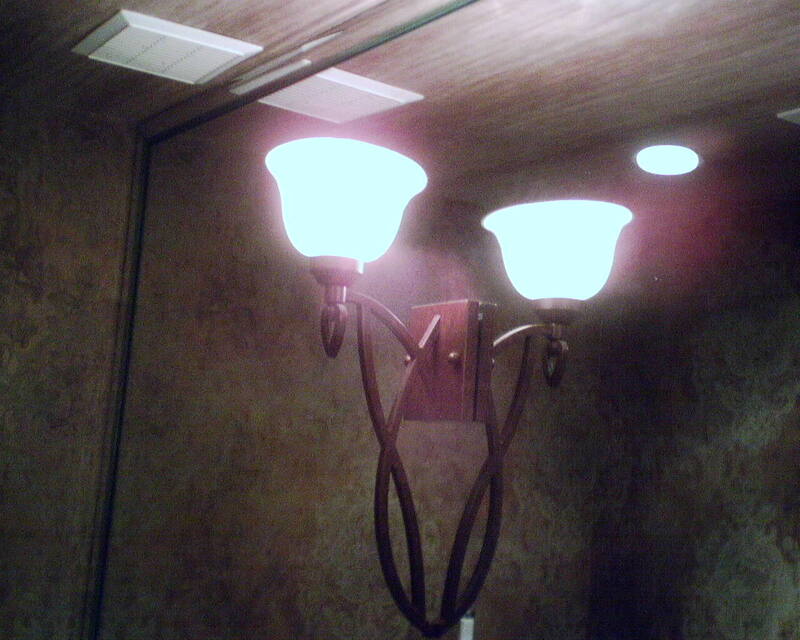 The finished room, with the dark vanity, dark granite countertop, and oil-rubbed bronze light fixtures, looked fantastic. To me, it looked like something out of a 14th Century castle. Unfortunately, all of these elements don’t show up on the photos (Man, is it difficult to get photographs of tiny rooms!!) But you get the idea. 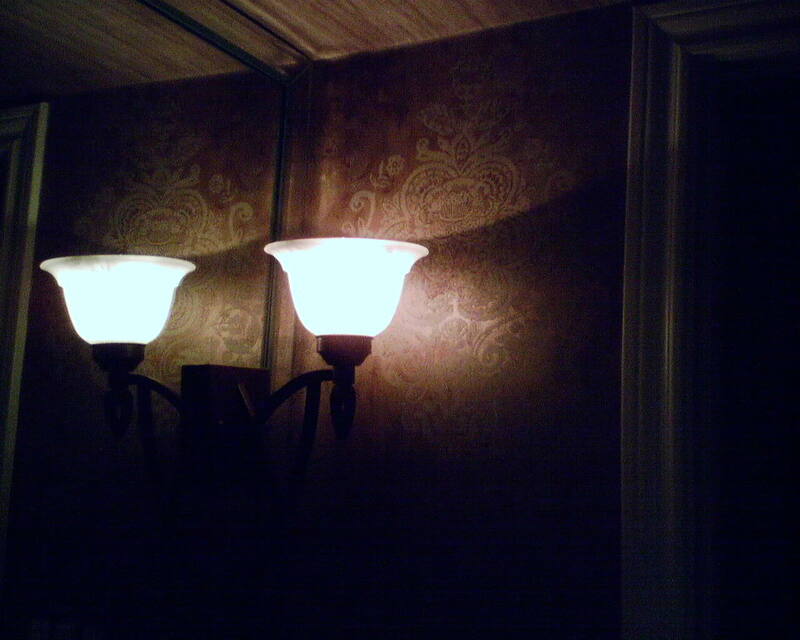 And, I can tell you – this finished powder room looks fantastic. AND … it will be ready to receive guests at the homeowners’ party on Christmas Eve. 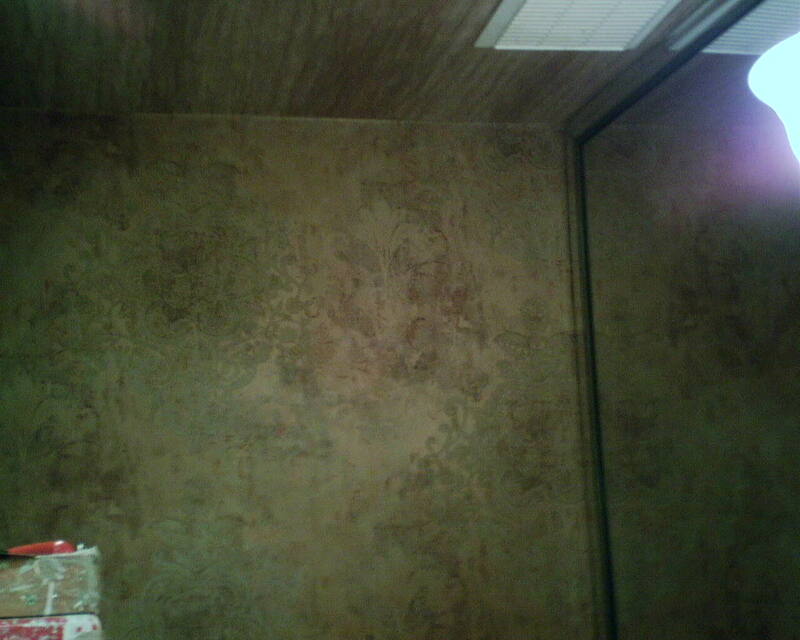 I hung this wallpaper in a powder room in Barker’s Landing, near I-10 / Memorial and Hwy 6, in west Houston. (Interestingly enough, I had done another job, in a dining room, in this same subdivision, just a few months ago.) It is by Designer Wallpapers, which is made by Seabrook, and was unusually nice to work with. Pattern numbers are FR61205 and FR61405. It was bought at a discounted price from Dorota Hartwig at Southwestern Paint on Bissonnet near Kirby. (713) 520-6262 or dorotasouthwestern@hotmail.com. Discuss your project and make an appointment before heading over to see her.